If You’re Not Happy and You Know It, Get Some Light! Our days have gotten shorter since June 20, but somehow I managed not to notice until a few weeks ago. Perhaps it is because we had a late summer here in the Northwest, and could comfortably leave home without a coat until late September. That’s also the time that my youngest headed off to college and, sad as that may be, it finally felt like the summer break was over! Just last week I went grocery shopping and was greeted by darkness as I came out of the store at 7:12 p.m. Rolling my cart to a brief stop just outside the automatic doors, I stared for a moment in confusion and grabbed my phone to check the time. Huh. Every year, about this time, I get SAD, along with 500,000 or so of my fellow Americans. SAD is Seasonal Affective Disorder, otherwise known as, “Oh my god, why is it dark all the time? It’s making me depressed and tired!” According to the Cleveland Clinic, another 10 percent to 20 percent of the population may suffer from a more mild form of winter blues. If this sounds familiar, maybe we can share strategies for chasing away the gloom and glum! This part of the country is known for its 50 shades of gray. The sky, people, keep your minds out of the gutter … which reminds me … we also have 50 ways it rains. And 50 ways to leave your lover, but that’s another story. The sky regularly moves from a slightly off-white mist to a dark and broody charcoal, and all shades between. We can go days without blue sky and sunshine. It can feel claustrophobic at times. The best remedy ever invented for this, aside from a flight to sunnier climes, is a HappyLight! That is just one brand, there are many manufacturers, shapes, and sizes. The trick is to spend 15–30 minutes a day with a light that produces 10,000 Lux. It is very important that you not diagnose yourself with SAD. If you have signs of depression, talk to your healthcare provider. Phototherapy, or bright light therapy, is a commonly accepted treatment for SAD. It may be used in conjunction with medications, talk therapy, or other strategies. There are some health conditions that it can worsen, so it is not recommended for all people. 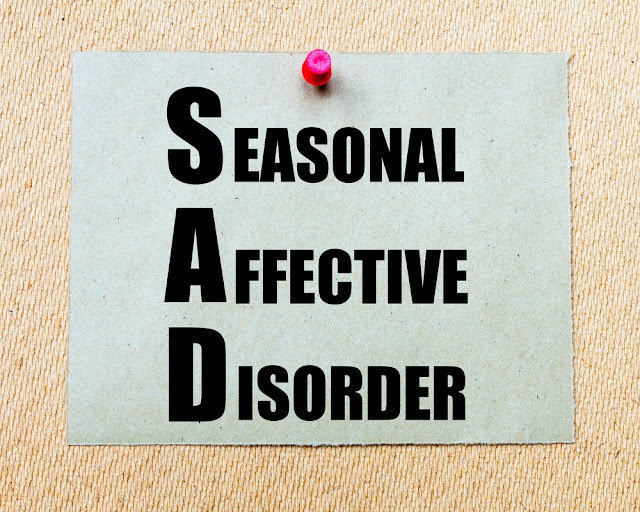 Your healthcare provider can help you choose the best treatment for your winter blues. I have my breakfast and morning coffee with Old Happy. I may read something pleasant (not the news … just leave that off until the spring). It is not necessary or recommended to stare directly into the light. Happy sits about 3 feet away from me and casts his bright and cheerful glow onto the table. I also chat with the dog and cat, in order to get some talk therapy in. Other strategies that have worked for me in the battle against SAD include eating lots of fruits, veggies, and healthy fats, vitamin D supplements, adequate sleep, daily exercise (or at least stretching), classical music, funny movies, uplifting books or news (check out the Daily Good ). A little time outside even on those gray days also helps.